I received the No. 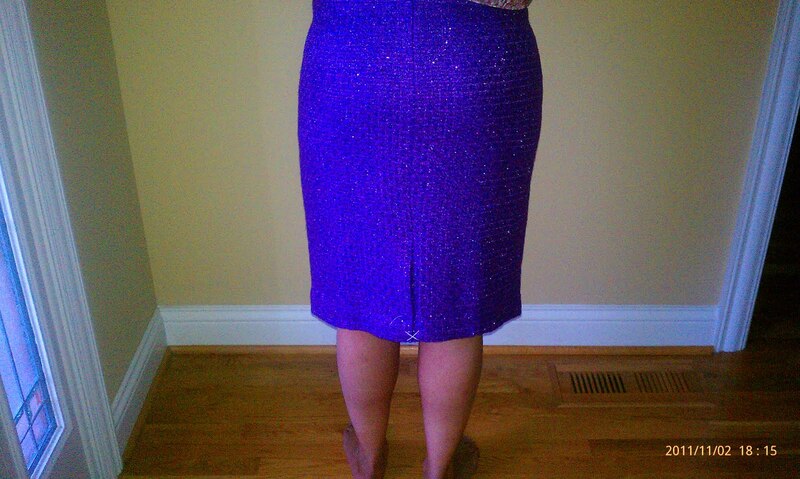 2 Pencil Skirt in Tinsel Tweed yesterday. I really like the skirt. The problem, however, is that it was damaged right out of the package. As you can see in the second picture below, there is a snag on the skirt in the back. My wonderful hubby noticed it immediately and said, “I cannot believe the person who packaged the skirt didn’t see that snag.” I can’t believe it either. I called CS immediately, and they’ve already sent me a new skirt. Hopefully the new skirt will be snag free!! 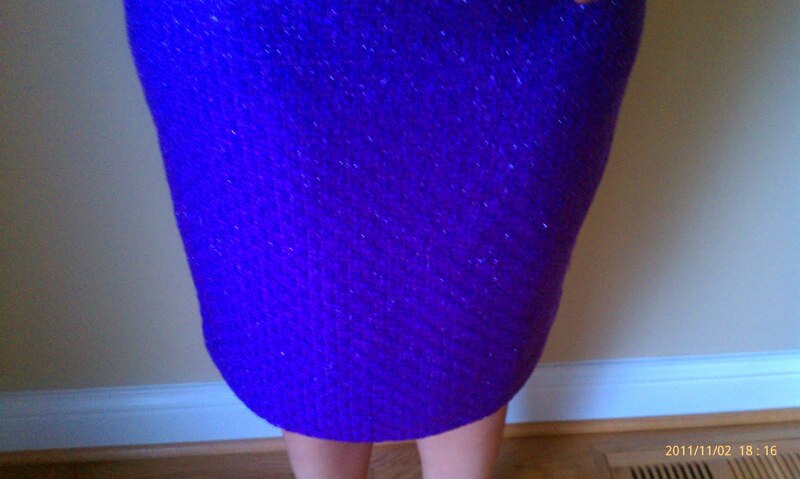 In these pictures, the skirt looks blue; however, it is a beautiful shade of purple. I know that there has been some discussion about the material content, particularly the acrylic in the skirt. For some reason, this doesn’t bother me. 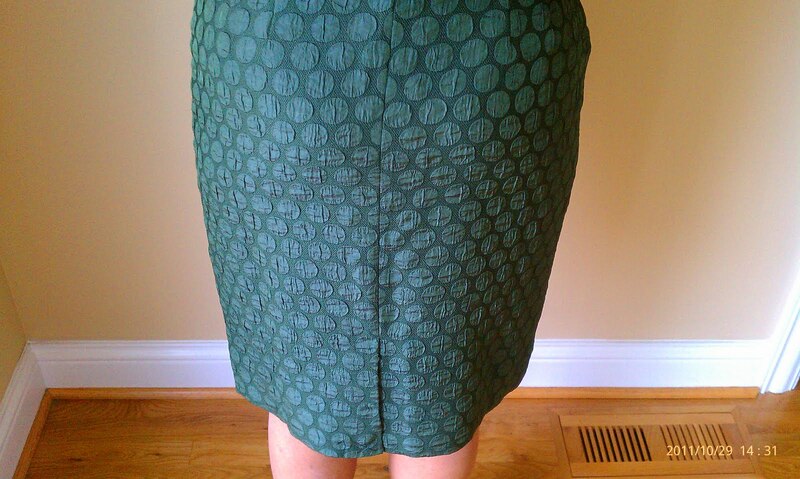 I don’t know if I’ve been drinking too much crewlade or not, but I really, really like this skirt. Here is the website picture; I really like the styling. What do you think of the No. 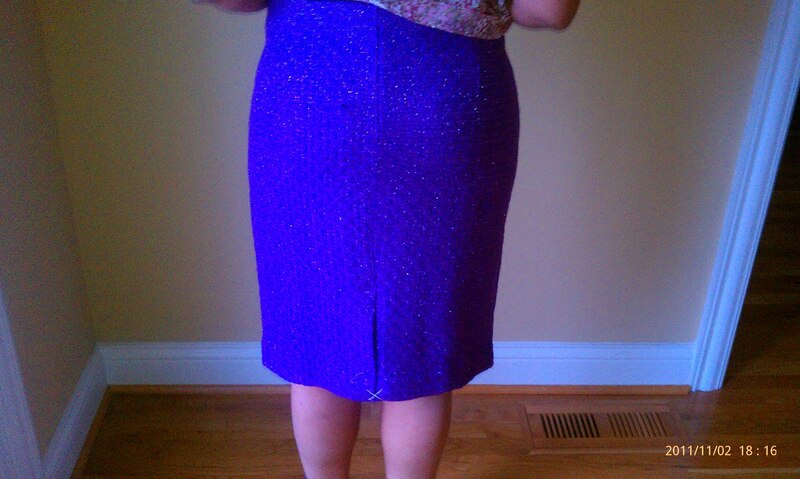 2 Pencil Skirt in Tinsel Tweed? Do tell! I received the Lady Lace Popover today, and let me tell you dear readers, it was love at first sight! And, thanks to Rose of the wonderful 1 More Shopping blog, this purchase was a *sweet* deal! I really like the fit. I know that there has been some discussion about tight arm syndrome, but I didn’t have that problem. My only problem is that I think the sweater emphasizes my problem area, my stomach. So, a Spanx purchase is definitely in order! 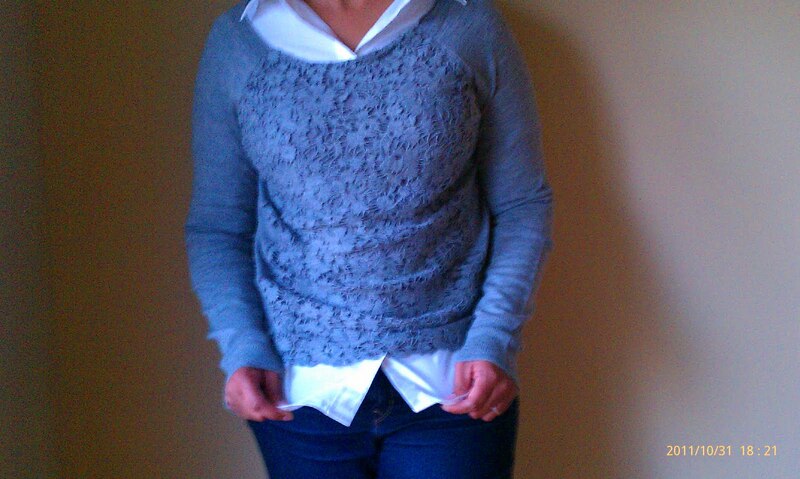 Here is a quick snap of me wearing the popover with a woven underneath. Sorry for the blurry pic, but our camera is broken–ugh! What do you think of the Lady Lace Popover? Do you own it? If so, how do you style yours? Do tell! 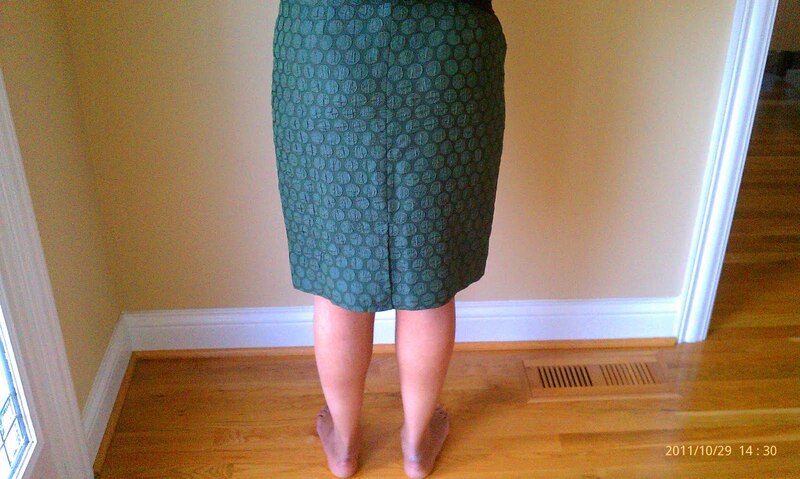 I was super excited to get my hands on the Goban Pencil Skirt from Anthropologie. 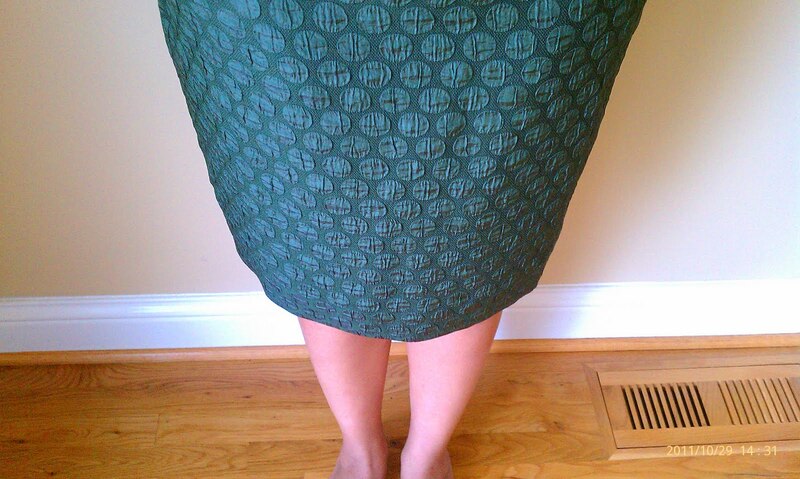 The pattern is beautiful; I look forward to wearing this lovely skirt very soon! Now, I just have to figure out how to style this beauty! What do you think of this skirt? Have you tried on any Anthropologie goodies lately? Do tell! A recent purchase has caused me to think a great deal about pattern mixing. I love the following blouse and skirt from Anthropologie; they were shown together in either the catalog or on the website. I wonder, however, if I am brave enough to pull it off. I think that these pieces are really great, and they really add variety to my wardrobe. However, I keep asking myself if they should be worn together. What do you think? Do you mix patterns? Do tell! I really like this bright color! 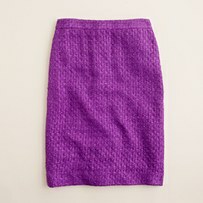 I’m trying to add more color to my wardrobe, so I’m looking forward to trying this lovely skirt on! 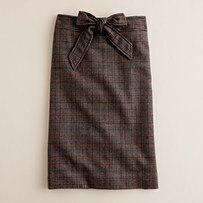 I really like the bow on this skirt, but I’m concerned about how the brown tones in the skirt will look against my skin. What do you think of these skirts? Do tell!